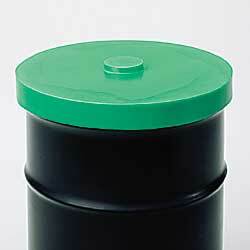 Oversized lid fits 15- to 55-gallon closed or open head drums. Molded .075" thick polyethylene material blocks out dirt, dust, and other contaminants. Does not fit tightly. Withstands drum stacking. SPECIFY COLOR: BL - Blue, BK - Black, GN - Green, RD - Red, WH - White, YL - Yellow. SELECTED MODELS IN BL - BLUE IN STOCK. Others FOB SOUTH CAROLINA. XA-2077BK 1-1/2	 15	 Black	 17"
XA-2077BL 1-1/2	 15	 Blue	 17"
XA-2077GN 1-1/2	 15	 Green	 17"
XA-2077RD 1-1/2	 15	 Red	 17"
XA-2077WH 1-1/2	 15	 White	 17"
XA-2077YL 1-1/2	 15	 Yellow	 17"
XA-2074BK 1-3/4	 20	 Black	 18"
XA-2074BL 1-3/4	 20	 Blue	 18"
XA-2074GN 1-3/4	 20	 Green	 18"
XA-2074RD 1-3/4	 20	 Red	 18"
XA-2074WH 1-3/4	 20	 White	 18"
*All colors are IN STOCK.